Current Durham Art Guild membership. Participation in this program is a great benefit of being connected to DAG. To learn more about membership, join, check on your membership, or to learn about scholarship options CLICK HERE. Completed online application. There are two separate applications linked below, one for new mentors and one for returning mentors. Choose the appropriate one and submit by Friday, November 2, 2018 at 11:59pm. Please be sure to read through the entire program information document linked below for full program details before applying. This is a paid position. Each mentor receives a stipend of $280 per month for January-May ($1,400 total) in honor of their time, expertise and dedication to the students and program. If you have questions about the Creative Mentorship Program and the application process, please contact Chellie LaPointe, DAG’s Education and Outreach Coordinator at outreach@durhamartguild.org. 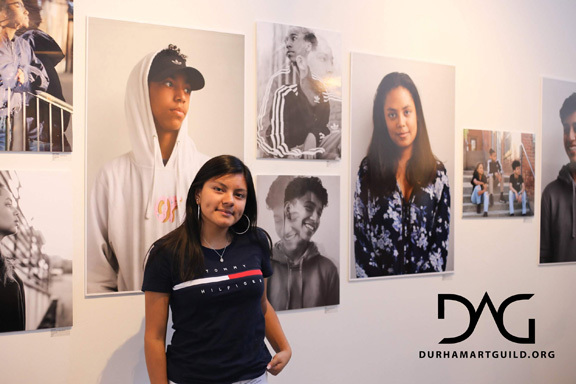 Featured image is of Maricarmen in front of her exhibition photographs from the 2018 Creative Mentorship Program.